135 To Cure an Ague Take dandilion clean washed stam it and put it in beer and let it stand all night in ye beer in the morning strain it and put half a spoonfull of treacle into it make it luke warm and let ye patient drink of it fasting upon his well day and walk upon it as long as he is able. 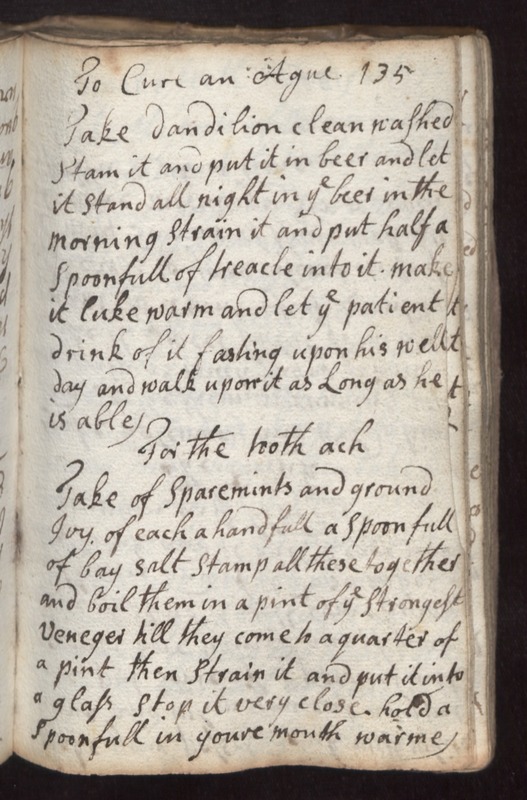 For the tooth ach Take of sparemints and ground ivy of each a handfull a spoonfull of bay salt stamp all these together and boil them in a pint of ye strongest veneger till they come to a quarter of a pint then strain it and put it into a glass. Stop it very close. Hold a spoonfull in your mouth warme.